Ever wonder what your baby looked like under water, but didn’t have Sir Robert Winston‘s film crew with you when you hit the local swimming pools? Now you can see what they’re up to under the waves. 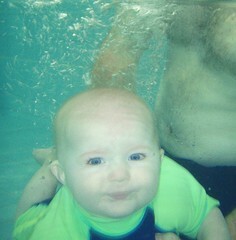 Our little diver provided us with this photograph today, courtesy of her Gran’s camera. Ours doesn’t do wet, so she kindly lent it to us to take some action shots. Miss OWW always blinks and closes her eyes as she is lowered into the water, so it was a surprise to see that she opens them up once below the surface. You live and learn something new about your baby every day. I can highly recommend attending swimming classes for little tots. It’s a great way of getting them confident in the water, a good opportunity for socialising and excellent for learning tips and tricks that you can take away for your own private swimming time. If you’re not comfortable in water then it would be a great idea to get some lessons and confidence yourself before taking your child to classes. In our class it is subtle but obvious who doesn’t feel 100% comfortable with being in the water and this definitely seems to translate over to their baby’s enjoyment. And one last tip – don’t take the baby to swimming classes (or the pool with the family) if they’ve been up for ages, they just can’t take it and will have a melt down. After about 30 minutes of being in the water Miss OWW begins to get irritable and wants to get out, then after the follow-up washing, drying and feeding she will easily sleep for the best part of two to three hours.